Today, it is Canon's turn in the limelight. Unfortunately for you all EOS lovers, there is no new DSLR, but there is something fairly interesting (which would have been more so if not for all the leaks) in the new Powershot G1X, which is like the G12 compact, but boasting a sensor that is slightly larger in size than a Micro Four Thirds sensor. As an aside, who comes up with these names? Between Panasonic's GX1, this Canon G1X, all the other G and X cameras, as well as the current D cameras, there is going to be some mighty fine confusion in the near future. Hint: The current Latin alphabet has 26 alphabets. Can we use some of the others? On to the G1X proper, the heart of the camera is an 18.7mm by 14mm CMOS sensor with 14 megapixels. That's about 1mm longer on each end than a Micro Four Thirds sensor. Then sensor itself goes from ISO 100 to ISO 12,800, and is mated to an optically stabilised 4x 28-112mm equivalent f/2.8-5.8 zoom lens. Given the size of the camera, the dimmer telephoto end of the zoom is a trade-off Canon had to make. The LCF is a 3" VGA affair mounted on an articulated arm, but unfortunately the optical viewfinder is the same useless optical tunnel similar to those on all Canon G series cameras. Personally I would have liked a high resolution EVF even if it meant a hump in the camera. The camera also does 1080p videos at 24 FPS. A big minus in my eye is the loss of the ISO dial; it has gone back to being a function on the directional pad instead. 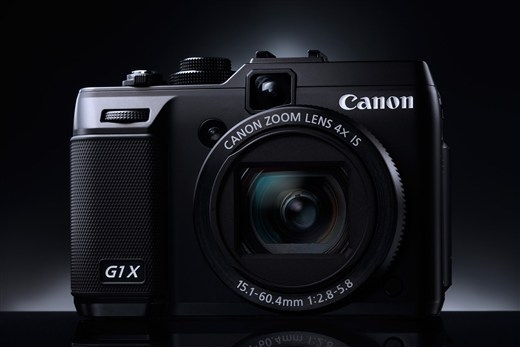 The Powershot G1X will ship in February for US$800. All-in-all, while the camera looks competent, I cannot help but feel this is a feeble attempt to counter the mirrorless march. For US$600 it is possible to get the Panasonic G3 with the 14-42 kit lens, which loses a couple of dials and buttons and a slightly slower and shorter lens, but adds a high quality EVF and the ability to change lenses. Both the giants are behind in this race, first Nikon with its Jekyll and Hyde One system, and now Canon with this. One hopes Canon has more up its sleeve. What do you Canon die-hards think? In any case, check out DPReview's comprehensive preview for the details.